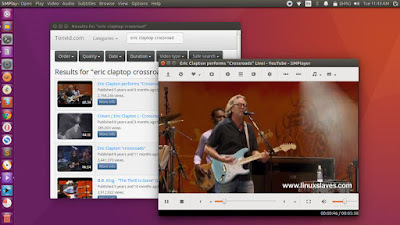 Install latest SMPlayer in Linux - SMPlayer is a graphical user interface (GUI) for the award-winning MPlayer, which is capable of playing almost all known video and audio formats. Apart from providing access for the most common and useful options of MPlayer, SMPlayer adds other interesting features like the possibility to play Youtube videos or download subtitles. It's a free media player for Windows and Linux with built-in codecs that can play virtually all video / audio formats, and doesn't need any external codecs e.g avi, mp4, mkv, mpeg, mov, divx, h.264, etc. More than free, it's open source! All you need is just install SMPlayer and you'll be able to play all formats without the hassle to find and install codec packs. SMPlayer supports the most known formats and codecs: avi, mp4, mkv, mpeg, mov, divx, h.264, and many more. Thanks to its built-in codecs, you don't need to find and install third party codecs. See all supported formats and codecs. This video player can also play YouTube videos. If need, it's can also available an optional plugin to search for YouTube videos. Make it yours! SMPlayer comes with several skins ad icon themes, so you can easily change the look and feel of the player. SMPlayer can search and save the subtitles from opensubtitles.org. Includes many advanced features like video and audio filters, change of the playback speed, adjustment of audio and subtitles delay, video equalizer and many more. More than 30 languages supported including Spanish, German, French, Italian, Russian, Chinese, Japanese. SMPlayer is available for Windows and Linux. SMPlayer is compatible with Microsoft Windows XP / Vista / 7 / 8 / 10. New option 'Show info on OSD' in View -> OSD (Shift + I). It displays info about the current media (resolution, bitrate...) on the OSD. More options in Preferences -> Playlist to better control the behaviour of the playlist, which makes easier to use the playlist for bookmarks. You can install the latest SMPlayer in your Ubuntu 14.04 LTS Trusty Tahr, 14.10 Utopic Unicorn, 15.04 Vivid Vervet, 15.10 Wily Werewolf, 16.04 Xenial Xerus, 16.10 XYakkety Yak and Ubuntu derivatives system e.g Linux Mint 17.1 Rebecca, 17.2 Rafaela, 17.3 Rosa, 18 Sarah, Elementary OS Luna, Freya, Loki. It will ask you to get 6,270 kB of archives and 19.9 MB of additional disk space will be used after the operation. Simply press Y to continue the installation. So that's all I can write about the step-by-step guide latest SMPlayer installation in Linux. Hope you've enjoyed reading this post. Thanks for visiting us!